When I saw the in-development video of Foppygames' Ranger last year on Pixel Prospector’s indev site I was immediately intrigued; it was the first time I'd seen a line-of-sight system used in an eight-way arcade shmup. 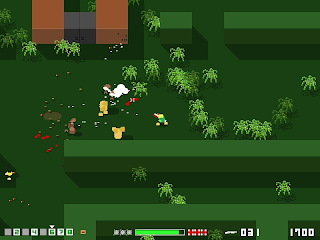 Normally a gameplay mechanic reserved for turn-based strategy games, the video showed the game's protagonist leaping in and out of cover, strafing bad guys with flak and hurling grenades all over the battle zone. With its clean 2.5D visuals, destructible environment, wide variety of enemies, arsenal of heavy weaponry and fast-paced real-time combat Ranger looked as though it was going to be one of the highlights of 2011. There's no real back story here, other than you play the part of the titular Ranger on a mission to rescue captured pilots from an infinite number alien worlds. 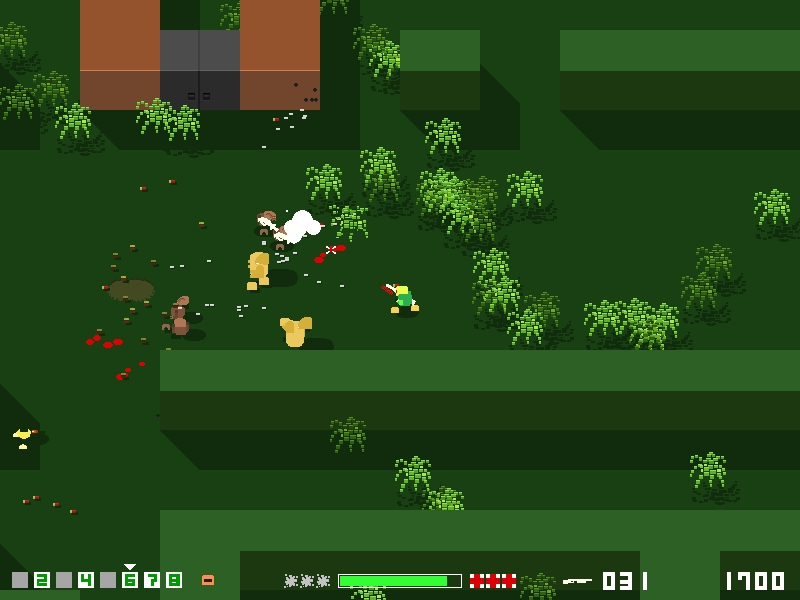 Upon landing on each new randomly generated planet you're goal is to travel northwards through heavily-guarded enemy territory and find the prisoner. When you've set the captured pilot free from his cell you must then guide him safely back to your waiting spacecraft, blasting your way back through an army of alien aggressors. Played via an instinctive mouse and keyboard combination (although Robotron-style dual joystick controls would have been my preferred option), Ranger starts of deceptively easy but the challenge of returning to the escape shuttle with the prisoner alive becomes more and more difficult as you progress through the increasingly dangerous and densely populated levels. The aliens have a nasty habit of respawning and ambushing you on your way back - which doesn't present too much of a problem to begin with, but on later missions you'll be grateful of the Ranger's ability to order the prisoner to wait behind. Leaving him to hide under cover whilst you duke it out with some of the more heavily armed enemies pays off in dividends - you'll need to keep the hapless fellow alive to ensure that you receive the much needed full ammo and medkit replenishment at the end of each battle. There is a lot to love about Ranger. 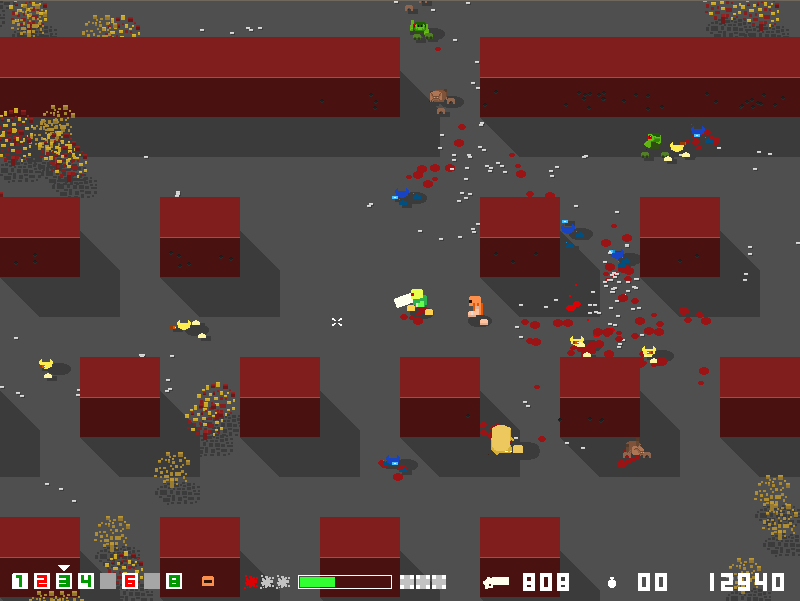 The environment is fully destructible and soon becomes littered with shells, corpses, craters, bullet holes and other debris, adding to the atmosphere and making it feel like a real, dynamic battlefield; you can literally blast your way though obstacles with your grenades and make your own path to glory. Also the enemy AI is reasonably effective, with aliens continuously scanning their field of view and only moving/attacking when they see you. They are pretty good at tracking the player - as is the prisoner, whom rarely gets stuck behind terrain whilst chasing you back to the shuttle. However, the real highpoint has to be the feeling you get when you successfully sneak unseen around and behind a gargantuan, minigun-wielding target and butcher them close range with a single round from your pump-action shotgun or a series of vicious combat-knife stabs. Ranger is full of these heroic, against-all-odds moments and they are ultimately what make it such a special game. Of course, Ranger isn't without it's flaws, the main culprit being the scoring system. Like many modern indie titles, the game has an online scoreboard facility - but the recent inclusion of a 'start at level 5' option (to meet demands requesting that there be a difficulty setting) effectively breaks this. Instead of two separate boards, the scores are all compiled on the same list, so to go for a high score you'll need to forego the difficulty option and trawl through the underwhelming and overly easy early stages of the game to rack up the points. Also, the game could have done with a bit more polish - the music, for example, doesn't loop precisely (the title screen track in particular has an annoying pause between repeats). This problem is easily remedied by editing the audio files, but end users really shouldn't have to do this themselves. Also, in full screen mode alt-tabbing out of the game from the menu results in all the text vanishing when you return, and you cannot enter names for the high score table via keyboard either. These little issues may sound picky and non-important, but they all detract from what is otherwise a superb and unique arcade blast 'em up experience. That said, please don't let the above issues dissuade you from giving Ranger a go yourself - regardless of my petty complaints it is still an excellent release that has provided us at RGCD with hours of frenzied and hectic gameplay. And if Foppygames are currently considering the possibility of a sequel (yes please! ), a proper, competitive scoring system, 360 joypad support and a two-player co-op mode would in my opinion make the game more than worthy of a commercial release. Download the game here (from the Foppygames website). Hey, thanks for this great review! (As well as for the feedback you gave earlier.) I agree the "start at level 5" option may not have been the best. And the alt-tab problem is a strange one, I have noticed it too. Still, I am happy with 4 out of 5 Atari joysticks! My next game will probably be a sequel to my older game Wizard Battle, but programmed in Monkey so it can be played in the browser.